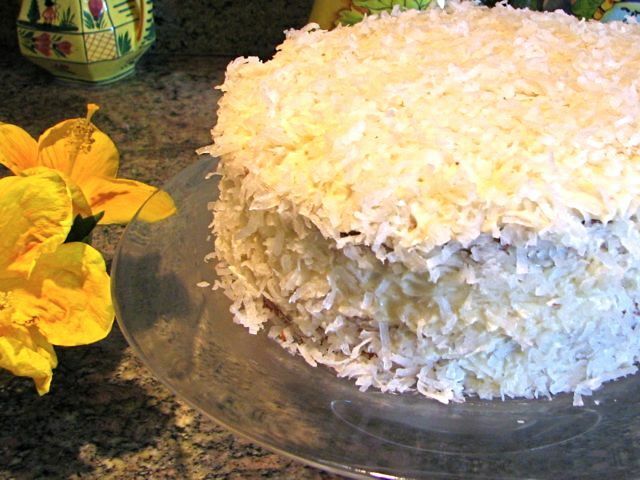 Many thanks go to my cousin Sharon Johnson for this family recipe for coconut cake. The cake has been her favorite since she was a child, and remains a beloved indulgence. Both the cake and the icing recipes are adapted from the Joy of Cooking. My great-aunt Minnie isn’t here to vouch for the recipe, but I believe the idea of raspberry jam between the cake layers must have come from her. It’s a gastronomic bridge between the Old World tastes she brought with her from Bohemia and the tropical flavor of coconut she discovered in Florida. Lightly oil two round 9-by-2-inch cake pans or three 8-by-2-inch cake pans. Dust with flour and tap out the excess. Preheat the oven to 350 degrees. Make the cake: In a large bowl, sift together the cake flour, baking powder, and salt. Set aside. In a small bowl, combine the milk and vanilla and almond extracts. In a large mixing bowl, beat the butter until creamy, about 1 minute. Gradually pour in 1½ cups sugar, scraping down the sides. Beat in the egg yolks, one at a time. Pour in a third of the flour mixture, followed by half the milk mixture. Beat at low speed to combine. Repeat, alternating the flour and the milk mixtures. In a separate bowl, whisk the four egg whites until stiff but not dry. Add the remaining ¼ cup sugar and the pinch of cream of tartar, if using. Gently fold one-fourth of the egg-white mixture into the cake batter to lighten it. Then add the remaining egg whites and fold, still using a light hand. Divide the batter into the prepared cake pans and spread evenly. Bake for 30 minutes, or until a tester inserted in the center comes out clean. Set the cake layers on racks and allow to cool for 15 minutes. Run a thin knife blade around the edges before inverting. Let the cakes cool right side up on the racks. Make the frosting: In a large mixing bowl, beat together the cream cheese and butter for a minute, or until smooth. Add the vanilla and powdered sugar. Continue beating for another minute, until the frosting is glossy. To assemble a two-layer cake: Place one cake layer on a plate or cake stand. Spread with the raspberry jam to the edge of the cake. Sprinkle 2 tablespoons of sweetened coconut over the jam. Top with the remaining cake layer. Spread the cake sides and top with the cream-cheese frosting. Smooth the frosting, then gently press the remaining coconut onto the frosting. To assemble a three-layer cake: Use the raspberry jam and 2 tablespoons of the sweetened coconut flakes between the first and second cake layers, and the cream-cheese frosting with an additional 2 tablespoons of coconut flakes on top of the second layer. Top with the third and final cake layer. Spread the remaining cream-cheese frosting on the top and sides. Smooth the frosting, then gently press the remaining coconut onto the frosting. If not serving right away, keep the cake covered and chilled.